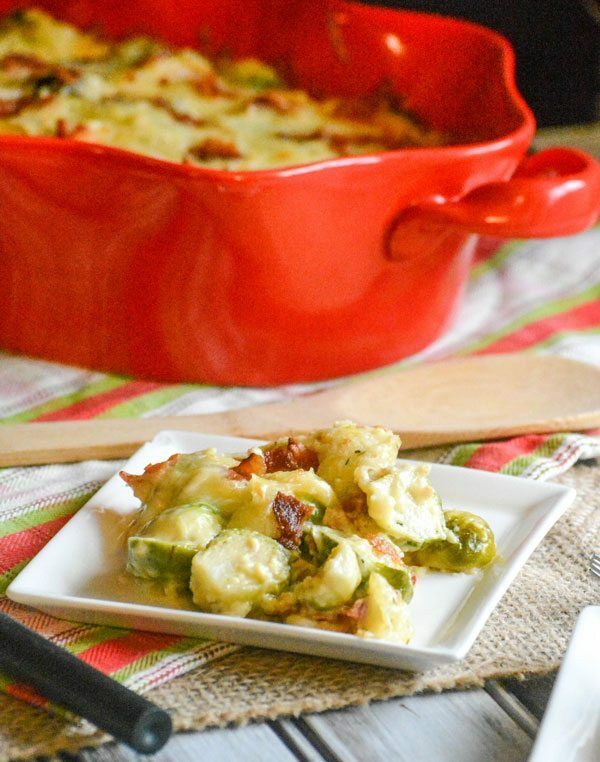 A comfy, cozy cheesy dish- this Cheesy Bacon Brussels Sprout Casserole is the best way to enjoy your veggies, and begs to be shared at the family table. I feel like I blinked and the seasons changed from Summer to Winter. We went from 80 degree days with cool nights to hoping we’d see highs over 30 degrees by mid-day. So not only have we pulled out the wool socks and thick coats, we’ve also begun pulling out our comfy, cozy recipes. I mean I want to be warm from the inside out! 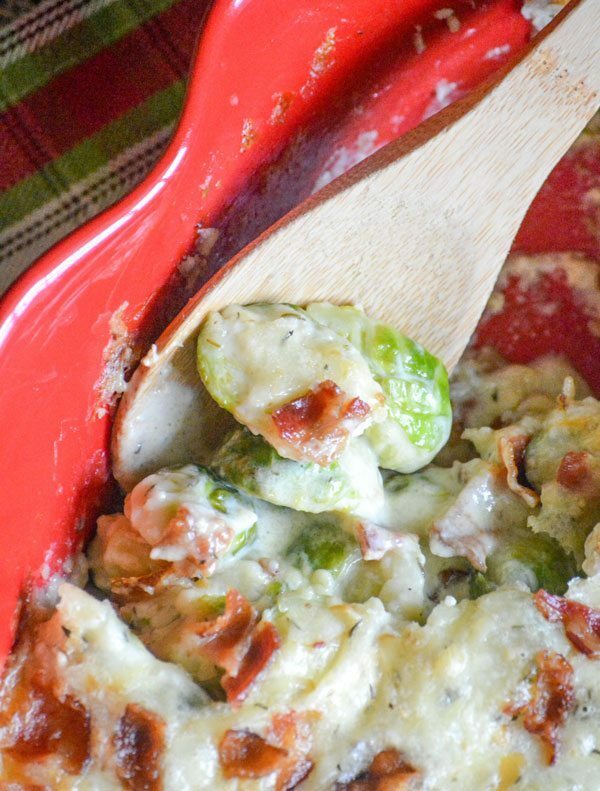 Nothing quite does the trick, like some of my Grandma’s tried and true dishes- especially her Cheesy Bacon Brussels Sprout Casserole. I know for many of you, when seasonal favorites come to mind, Brussels sprouts probably aren’t at the top of the list. They’re probably not on your list at all. In fact, for many people the mere mention of the tiny cabbages elicits a negative reaction- and Granny’s version can bring back dreaded memories. Like not being able to leave the Holiday table until you’d finished your food, including the soggy, boiled, bland sprouts on your plate. But, I’m here to tell you that there’s no longer any reason to be afraid, or to ever see (let alone eat) a bloated soggy sprout again. It’s all in how you cook them. Roasting them caramelizes them and sweetens them. 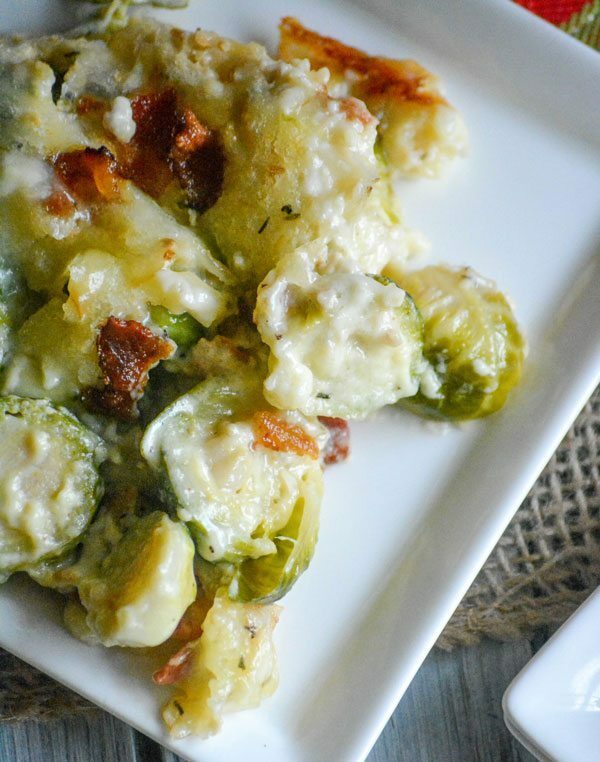 Roasted sprouts are so yummy, they’re darn near addicting! Add in a hearty amount of multiple cheeses? That’s a melting pot of a dish I can’t wait to sink my teeth into. 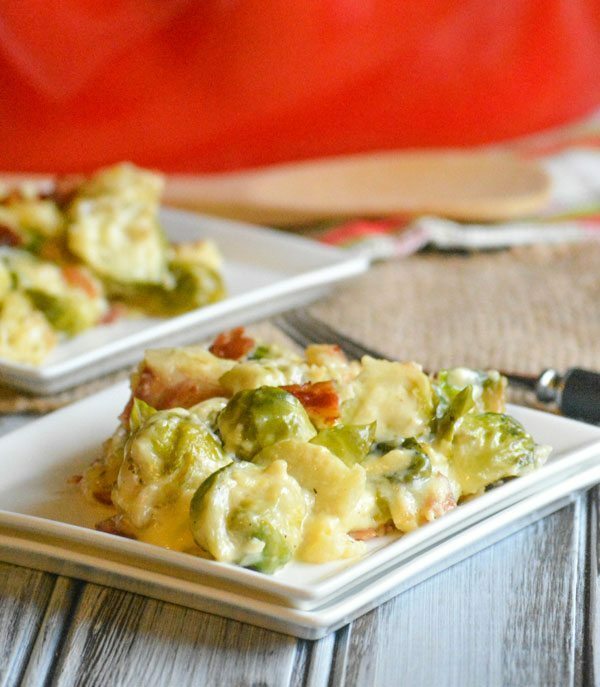 This Cheesy Bacon Brussels Sprout Casserole features roasted sprouts, crisp crumbled bacon stirred with several cheeses and baked to golden brown perfection. It’s full on flavor in every single bite. It’s the perfect thing to serve at big family dinners when you want everybody to come together for a memorable meal. Your family will never see sprouts the same way again, and even Grandma will approve! Add the sprouts and olive oil to a large bowl, tossing to coat the sprouts. Season liberally with salt & pepper. Transfer them to a large baking dish, and roast them at 400 degrees for 20-25 minutes- or until they're semi soft. In a separate large mixing bowl, beat the eggs. Whisk in the cream, until evenly combined. 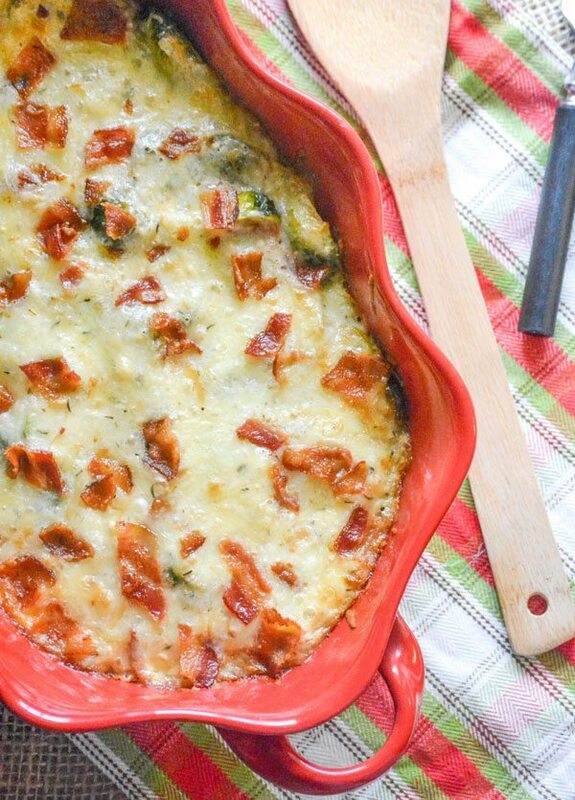 Stir in the cheeses & almost all of the bacon. Season with the garlic & thyme, stir to combine. 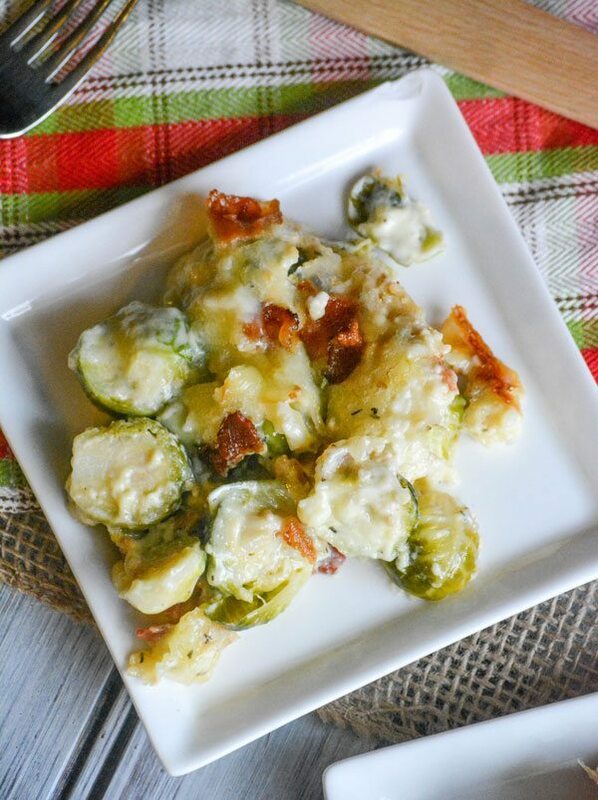 Top the roasted sprouts with the cheese mixture, stirring slightly to combine. Sprinkle the rest of the crumbled bacon evenly out over top. Bake at 350 degrees for 25 minutes, or until the casserole's set and golden brown. Let the mixture rest 3-5 minutes, serve & enjoy!